This Lightroom lookalike undercuts it on price, but does it cut back on features too? PhotoDirector is an interesting low-cost alternative to Lightroom – or at least it would be if the cost really was substantially lower. As it is, it feels like a slightly overpriced clone. PhotoDirector's resemblance to Lightroom is quite striking. It has the same broad workflow, with different modules activated by buttons running across the top. These include a Library, Adjustment, Edit, Slideshow and Print panels. It doesn't have Lightroom's Map, Book, Slideshow and Web panels, but these are probably not top of most photographers' must-have lists anyway. So why does PhotoDirector have both an 'Adjustment' and an 'Edit' tab? That's because they offer non-destructive and 'destructive' adjustments respectively. Lightroom is purely non-destructive. There are things a non-destructive tool like this can't do, like layers and masks, and for those Lightroom must pass you over to a regular image-editor like Photoshop. PhotoDirector, however, offers many of these conventional adjustments without the need for an external editor. In the Edit panel you can remove objects or backgrounds, combine images, blend HDR exposure sequences, create panoramas and makepeople look more beautiful with 'Beautifier' tools and a Body Shaper. The downside is that these tools are quite amateur-orientated and certainly don't cover the whole range of photo projects and adjustments people might want to try – and, unlike Lightroom, PhotoDirector doesn't let you send images to an external image editor from within the program. PhotoDirector takes a step further than Lightroom by adding regular image-editing tools. This could be a cause of confusion for some users because while PhotoDirector's Adjustment module offers non-destructive editing tools, just like Lightroom, its Edit module acts like a regular image-editor. When you switch to the Edit panel with a photo selected, a dialog advises you that PhotoDirector is about to make a copy – this does at least save you accidentally overwriting an existing JPEG file. PhotoDirector mixes non-destructive Lightroom-style editing with conventional 'destructive' tools. Non-destructive adjustments can only take you so far, and the tools in the Edit panel do things that non-destructive editing can't. These tools are arranged in an expanding set of panels on the left side of the screen (see the screenshot above). You can use some extensive People Beautifier tools as we've done above, add a small range of effects, combine images, merge HDR exposures and add watermarks. Unfortunately, while these Edit tools do add to PhotoDirector's versatility, they don't anywhere near far enough to replace a regular image-editor like Elements. The Photo Composer, for lets you create simple cutouts and photo montages, but it's a million miles from a proper layers system. It's in the Adjustment panel that you get to carry out the same non-destructive enhancements as Lightroom, and where the similarities are most obvious, right down to the adjustment brush, gradient mask, radial mask and spot removal tools. It's all very smooth and slick, but you can never escape the feeling you're working with a cut-price Lightroom clone – except that the price isn't cut by all that much. 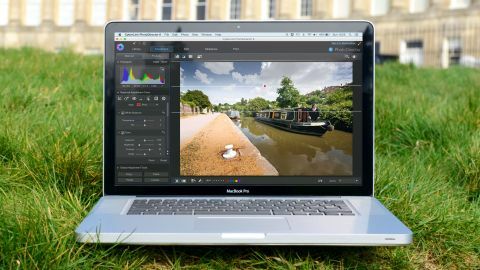 You do get the extra tools in the Edit panel, but you lose out on Lightroom's Map, Book, Slideshow and Web panels, and there's no equivalent of Lightroom's Upright automatic perspective correction tool, its Quick Develop tools or its Smart Previews for editing images stored on devices which are offline.